You can block force pushes (git push --force) on all branches—or just the default branch—of a repository. Note: Each repository automatically inherits default settings from the organization or user that owns it. You cannot override the default setting if the repository's owner has enforced the setting on all of their repositories. Sign in to your GitHub Enterprise instance at http(s)://HOSTNAME/login. In the search field, type the name of the repository and click Search. In the search results, click the name of the repository. In the upper-right corner of the page, click Admin. 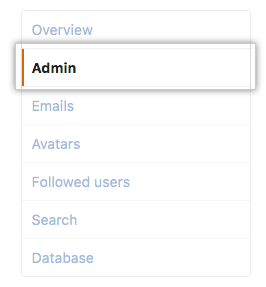 In the left sidebar, click Admin. Select Block or Block to the default branch under Push and Pull. The change takes effect immediately. If you change your mind later, you can easily re-allow force pushes. "Blocking force pushes to repostories owned by a user account or organization"
"Blocking force pushes on your appliance"